We are the bestest ever! Progression updated and thread renamed to "WotLK Progression". Schedules permitting, we might attempt to add some more Yogg-achievements to the list, but that aside, with Algalon defeated, this is our final kill list for Wrath of the Lich King and about as far as we ever dreamed to come. I'd like to say Thank You to everyone who was part of this journey at any point. 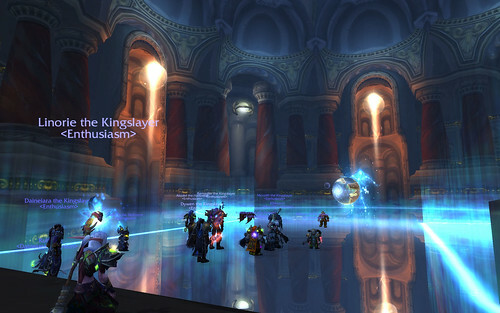 Enthusiasm started raiding at the end of Feb 2010, with a not quite full team in Naxx. It's come a long, long way since then. We've had a lot of people come and go, in Team Enthu during this time, we've had our ups and downs, and it's been a long strange trip this far. I'd like to say a thank you to all those who've been with us on some or all of this journey so far, whereever they are, whatever they're doing. Everyone has helped shape this journey. But I'd like to say an especial thanks to our Raid Leader, who's been there throughout, putting in a lot of blood, sweat and tears for us to get this far. I hope that this progression thread is how you'd imagined it would be like back in Feb 2010! Lots of memories looking back through this thread its been an awesome experience coming throught to where we are now, and heres to the future! Heh. Amazing. I was around from Putricide onward and it's been brilliant. I've already written what effectively became an ode to Enthusiasm so I won't repeat it here and I said this last night at some point on Vent, but I *can't wait* to be running blind into a brand new raid or dungeon with you guys, laughing as we wipe and then blaming it on Dywen (*grin*). Rather than post a million screenshots here, I'll post just one. Click it and you'll go straight to the Flickr set of the screenshots I took last night. I recommend lightbox view (click on the magnifiying glass with the + in the top-right corner), or possibly even slideshow view (from the Actions menu). with just our collossal health pools to comfort us. This is what happens when you trust NHS dentists.